Already, the Forces of Light are gaining ground, making progress, winning hearts and minds. Even now, it is possible to predict a sure and safe outcome to the struggle which has been raging, albeit unknown to the majority of men, for the future of planet Earth and its inhabitants. For countless ages, that struggle has been fought on every plane, in all conditions and situations, and is the very fabric of the history of the world. At long, long last, a new light can be observed in the aura of the race of men, one that augurs well for the future of the race. From where does this new light come? It is, of course, the result of many happenings and benedictions, but above all, it is the sign that men are beginning to see themselves in a new light, beginning to sense themselves as at least potentially divine, certainly more worthy and meaningful than they had thought, and capable of creating a world in which they can take pride. Seeing this new light within humanity, Maitreya knows that men are awakening to His efforts and energies, that the new potencies of Aquarius are fulfilling their promise, and are drawing men together in a sensed unity of purpose and pride. From now on, this dawning sense of unity, and the strength which it engenders, will manifest itself more and more, and will lead to organized action by many to better their lot, to change conditions which belittle men and leave them helpless. In this way, a substantial change in world conditions will take place in a relatively short period of time. Men are approaching the nadir of their self-induced misfortune. Destructiveness and war, complacency, selfishness and greed, have all played a part in creating these painful conditions. The awakening, the new light, is a sign that men are beginning to understand the Great Law: harmlessness, alone, brings men into correct relation with the Law of Cause and Effect, the fundamental Law of our lives. This is a spiritual truism but one that the race of men has found difficult to understand or accept. Such an understanding and acceptance would change for ever, and at a stroke, much unnecessary pain and suffering in our world. The Aquarian Energies, gathering potency with every day that passes, will make it easier for men to see the need for harmlessness. These benign forces work towards fusion and synthesis and so lessen the desire for competition and assertive individualism. The signs are beginning to show that man is on his way. Q. How many television interviews has Maitreya had to date? A. Twenty-three (7 September 2010). Q. On 18 July 2010 Nelson Mandela turned 92. Could you please comment on his influence both in his country, South Africa, and in the world? He seems to be such an extraordinary man and a great example to all. A. For years before the ending of apartheid in South Africa and the freeing of Nelson Mandela after 27 years in prison, many politicians, especially in Britain, predicted ‘rivers of blood’ if South Africa had a government of Africans. Nelson Mandela, prompted by Maitreya, called for forgiveness of past wrongs and a new coalition of black and white South Africans. The result was relative peace and no ‘rivers of blood’ in a new South Africa. Q. Are the Space Brothers stepping up their appearances not only of their craft but also in direct contact with individuals? A. No. Not particularly in their direct contact with individuals. Q. Is it true that certain mountains and mountain ranges are bases for the Space Brothers? Q. In the June 2010 issue of Share International, Benjamin Creme’s Master says: “Men are about to experience a profound truth, an awareness of their essential Being…. The joy and beauty of Brotherhood will thrill through their Being, and each will see themselves as a part of that beauty and love.” Is He referring to the Day of Declaration or something else? A. The Master was referring to the Day of Declaration. Q. Is wi-fi equipment dangerous to have near a person’s head when sleeping? Can brain tumours result? Q. I’ve been reading so many books about the Buddha and wondering why they say that the Buddha said there is no such thing as God? A. Buddha never said there was no such thing as God. What the Buddha said was, What could you know about God? What do you know about yourself? Do you know anything about yourself? No? So how could you know anything about God? Leave God aside, for the time being, and find out who you are. That’s what the Buddha said. It is a very different thing from saying there is no such thing as God. Q. 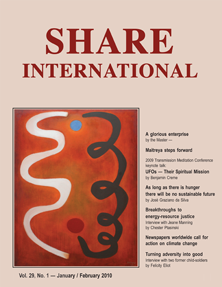 What does the symbol used on the Share International website represent? A. It is actually taken from one of my paintings, called ‘The Flaming Diamond’. The Flaming Diamond actually exists. It is a great Rod of Initiation. It is in etheric matter, not solid physical matter. It is a Rod, finishing in a colossal diamond. The flames represent the energies streaming out. The Great Rod is used at the third, fourth and fifth initiations by the Lord of the World. The Great Rod is charged by the Sun’s energies at certain times by the Lord of the World, Sanat Kumara, on Shamballa, the highest centre on our Planet. So we have humanity, the Spiritual Hierarchy, of which Maitreya is the Head, and above these, Shamballa, and on Shamballa is a Being Who has been on this planet for literally millions of years. He looks like a youth, He is called the Youth of Endless Summers, He is the Jehovah of the Bible, He is the Lord of the World, the One Initiator. He initiates the Masters, and the third and fourth degree initiates. Maitreya initiates the first and second degree initiates, using what is called ‘The Lesser Rod’. Jesus said: “No man can come unto the Father except through Me”, and this is taken to mean that no man can know the Father until he has become a Christian. It is nothing to do with that. Maitreya, through Jesus, was saying: no one can stand before the Father, the Lord of the World on Shamballa, and be initiated by Him, who has not first of all stood before Maitreya, the Christ, and been initiated by Him at the first two initiations. Q. Is Maitreya an alien? A. No, He’s not an alien. “Alien” is a strange word to use. There are no aliens anywhere. It is a misuse of the term, since we are all brothers, all part of the One humanity. Humanity is everywhere in cosmos. Maitreya comes from Earth, was born on Earth and will stay on Earth for the next at least 2,500 years. Q. Did any Masters go to your 2010 lectures in Tokyo and Osaka? A. Maitreya and the Master Jesus were in Tokyo; Maitreya, the Master Jesus and the Master in Tokyo were in Osaka. Q. When Maitreya appears on Japanese television will He look Japanese? A. Maitreya will appear in His ‘body of manifestation’. He is not Japanese, so He will not look Japanese. Q. Will He be speaking Japanese? A. Yes, He will speak Japanese. Q. Is there any way to overcome the fear of death? A. We all have to die. It is sad that many people live their lives in fear; one of the biggest fears is that of death. If only they knew how easy it is to die compared with being born they would be amazed that they spent so much time in fear. Dying is simple and not frightening. One of Maitreya’s many ‘main tasks’ is to rid humanity of fear, including fear of death. In the 19th century the Master Hilarion stimulated the formation of the Spiritualist Movement precisely to help rid humanity of the fear of death. The fear of death is usually the fear of extinction for ever, whereas the truth is that life is everlasting. We are souls; the soul incarnates again and again until there is complete union between the soul and its reflection, the man or woman on the physical plane. When they become one, and are therefore a Master, they are free for ever from what we call death. Q. Are there any politicians in Japan who are inspired by Maitreya? A. There are those who have heard of Maitreya and His priorities and who think highly of this information but who do not act because they feel helpless. There are a few who are what you would call directly inspired – but by the Master in Tokyo. The Master in Tokyo has disciples through whom He works. In every country are being gathered people who are responsive to the wider world rather than to their own individual country. These people will provide the frameworks of the new governments which will be formed, by democratic election, in every country. Sincerity and altruism will be the hallmarks of the new governments. Q. Are there politicians in the world who are inspired by Maitreya? A. There are very few politicians of the old school who know or care anything about Maitreya. But in the centres, especially in those where a Master lives, there are a growing number of selected groups of people who have been brought together. They know the plan and know what humanity needs, and through their obvious lack of ego and obvious sincerity they will be put in positions of influence and power. These questions are often about individuals. The energies of Aquarius, however, only work through groups. The idea of an enlightened or strong person coming out and forming a group is changing. But when a group is working as a group, not as individuals, then the energies of Aquarius can be contacted and used. Q. Why will it take so long for the new Technology of Light to be implemented? A. As soon as we accept that war is finished for ever, and as soon as we accept the principle of sharing, and make war a thing of the past we will have the energy from the sun. At the moment, no nation can be trusted to use this energy for other than its own purposes. The new energy could provide weapons more powerful even than the atomic bomb. Only when all of us renounce war for ever will we be trusted with that energy. Q. I would like to be guided by Maitreya, the Masters and the Space Brothers. What should I do to achieve that? A. According to Maitreya the best thing you can do is to practise what He calls the three most important facets of His teaching: honesty of mind, sincerity of spirit and detachment. Cultivate these three and you make the easiest and simplest advance. Q. If I want to live and work for world peace I tend to live in a way which my parents disapprove of. Should I choose to live correctly for the bigger vision even though that would mean I would be disobeying my parents? A. I would say, be yourself. If you have to have your parents’ permission to live correctly, there must be something wrong with their ideas. If you have a vision and you believe it to be the right vision you have to follow that. How could you do otherwise? If the world were run by young people and children it would probably be a wonderful world. It would be filled with the aspiration and the good of all the young people of the world who are full of longing for justice, sharing and right relationship and are ready for it – long before their old parents and grandparents. Thank you for all your wisdom and information. I found your books the most interesting I have ever read. I am writing to ask if an experience I had could have been a meeting with Maitreya. I was visiting London on 4 July 2010 from Edinburgh and I had been asking if I could meet Maitreya. These have been my thoughts for a few months. I was walking towards a railway station and as I walked past a slender black man, he asked me for food. When I turned round I was surprised as he looked so healthy, his eyes so radiant, he didn’t look like a beggar. I searched my bag and found a snack and gave it to him. I turned away and then turned back and asked him his name. He answered: “Mark Nelson.” This name also is strange as I was recently thinking about forgiving two people in my life: one is called Mark and the other Nelson. Was this Maitreya? When I turned around again he was gone. I was feeling very sad before I met him; afterwards I was so happy I was crying. On 5 June 2010 about 2pm I participated in the monthly Peace Watch on the Stadhuisbrug in Utrecht, together with a number of people from various peace groups. Recently I had made peace cards in the shape of a dove and on the inside texts like: “Only sharing and justice will bring lasting peace – Maitreya” and “There is no way to peace, peace is the way”. I gave a card to every one of us. After 20 minutes or so, two old-fashioned and peculiarly dressed elderly ladies came shuffling along, arm in arm, floral dresses with bare white legs and white socks in sandals. One had spiky hair, the other had her hair in a knot. They approached one of us, who told them about the theme of the day and the Peace Watch itself. Then one of the ladies asked after the ‘dove’ card, and my colleague gave her one. Both ladies looked at us directly and said: “You are doing a good job”, said “bye” and went their own way. I did not give it much thought, until later, cycling home, I thought: “This really was out of the ordinary.” Who were these ladies? I would much appreciate your comments. One day in Tijuana, Mexico, while crossing a certain plaza as I always do, I noticed a poor beggar woman sitting under a tree staring at me with such an intensity that I stopped and the thought ‘that is Maitreya’ came to me, but I ignored it and kept going, somewhat embarrassed at myself, as there are so many who beg, and I must be merely guilty of illogical ‘wishful thinking’. But the following Sunday again I went this way and she was there again under the same tree. With her was a girl of perhaps 10 years of age who walked over as beggar children often do, and I found a two peso Mexican coin to give her. I fumbled for more but that was all I came up with. Handing it to her I apologized for giving her so little. She smiled warmly and took the coin, and did not exhibit the desperate eyes such children always seem to have, but instead seemed to glow with genuine kindness and a certain self assurance that again did not fit the usual pattern. I turned away to continue on my way, and suddenly she grasped hold of my hand. I was flooded with an overwhelming love from this girl to the point where I am asking who was this encounter with? To the best of my knowledge this happened on 26 September 2009. A statue overlooks this plaza and I recently noticed it bears a title that reads: ‘Cambio de Piel’. In English that means ‘A Change of Skin’! I am suddenly reminded of the Biblical prophesy ‘and a child shall lead them’. M.C., Colonia Constitution, Baja California, Mexico. On Saturday 29 May 2010 my wife and I were working at the Share International stall in London’s Mind Body Spirit fair. Around mid-afternoon a man, probably in his thirties, with dark hair and dark eyes visited the stall showing a particular interest in the miracles display board on our wall. He liked one of the images which showed an iconic painting of Jesus oozing oil. He said he was an artist and was working on an unusual form of icon painting. One of his paintings was on his mobile phone and he showed it to us. Somehow it looked as if it was painted out of light, if you can imagine such a thing. Apparently other people had also remarked on the unusual effect of the light. His accent was Australian but he looked as if originally he came from the Mediterranean region, perhaps Greece. As he spoke, I notice a name badge on his jacket, which said ‘Christos’ and then a surname I can’t remember. We spoke for about 10 minutes or so and he seemed a warm, friendly guy, a little quirky perhaps. As he left, he put his hand on my shoulder and wished us well. Could this have been Maitreya? On 6 May 2010, my sister and I visited the Victoria and Albert Museum in London. We were weary after tramping around the city and took a tea break in the Museum’s ornate Victorian tearooms. On our way to find the gallery we wanted, we came across a small exhibition on Buddhism. There were several exquisite statues of Buddhas from China, Tibet, Pakistan and Thailand. We stopped at a beautiful figure of a Tara and both started to experience what we thought was a blessing, this state continued to the end of the display, more focussed at some statues. On leaving, we felt refreshed and vibrant. Once outside the museum, I noticed a man sitting in a relaxed fashion on a bench. He was dressed in a winter coat as it was unusually cold for this time of year, the collar upturned to shield his neck, the top buttons were done up, but the rest undone to reveal a portly tummy, his legs were nonchalantly crossed and he was wearing bedroom slippers! On our approach, his eyes darted from side to side and suddenly, he drew up the tall collar to hide his head completely for a couple of seconds, then revealed it again, showing a full head of curly grey hair, and a full curly grey beard. There were two large zipped bags placed to one side and I took him to be homeless, although he was uncommonly clean. Would you kindly ask your Master if my sister and I did receive a blessing in the Museum and if the Irish man was a Master? S.P., Forest Row, Sussex, England. On 29 July 2010 I walked out into my garden at 11pm to feed hedgehogs as I do most evenings, and looked up at the sky. Heading towards our house was a very large bright red/orange craft. It seemed to be about 3,000 feet up, almost square-shaped, but the whole of the underneath was pulsating with lights. I was transfixed. It just came out of nowhere, and was absolutely silent. 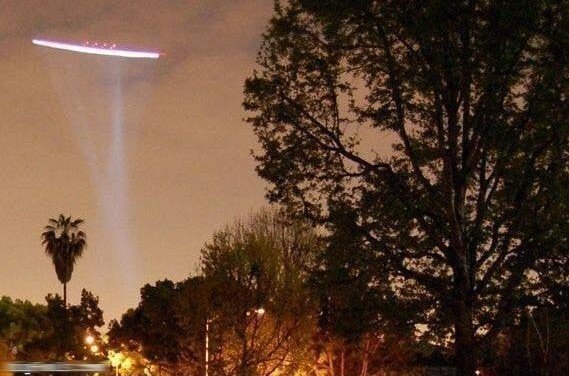 It flew directly over our house and I could see details of it, and the pulsating lights underneath. It seemed to shimmer with light. It went in a direct line from north to east for some miles then disappeared after a few minutes. Just before this, I had inwardly asked Maitreya to help me with a problem I was having with my neighbour, and I was feeling scared. As this craft went over I felt flooded with peace and love, it was almost like the energy from the overshadowing at Benjamin Creme’s lectures. I feel it came in response to my thoughts. Four days later, at 11pm, I was in the garden again when I saw a very bright orange ball some miles away, and ran to call my partner outside. Another one followed, and by the time he arrived, five or six had flown past. We began counting and in all, over 30 minutes 36 flew past. They were evenly spaced, very high up (5-10,000 feet? ), coming from the east flying north. They flew in a straight line then all turned, one after the other, at exactly the same spot and started to climb up as though onto a flight path, all flying in the same trajectory towards south-east. They seemed purposeful and co-ordinated, nothing at all like the paper lanterns people usually suggest as an answer! We used binoculars which were inadequate to catch the full description but my partner (and his brother and mother whom we had called in London) could see rows of lights along what they both saw as fat cigar shapes. They looked like glowing balls of fire to me. We have felt very peaceful and full of energy for a few days now. 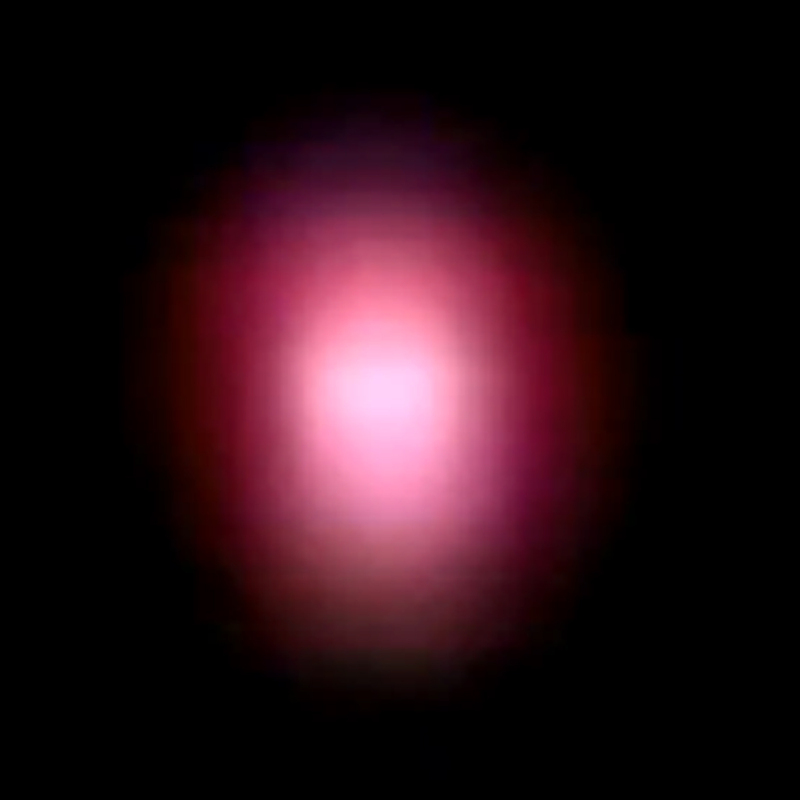 (1) What was the object I saw on 29 July? (2) Were the spaceships I saw on 1 August from Mars? And why were 36 flying at that time? In 1995 I was in the neighborhood where our family had attended church when I was little. It was about 8am and I had some time to kill before going to an appointment nearby. This part of Kansas City, my hometown, had fallen on hard economic times and the neighborhood was much more run down than it had been when I was growing up. It had turned into a rough area, but since it was early in the morning I didn’t figure there would be any danger in going for a little stroll through the neighborhood for old time’s sake. So I did and all was well and quiet until a low-rider style car with what I thought was two young men in it pulled up to the curb by me. I don’t remember what they said but I was concerned because they looked the gangster type. Then a third young man sat up from laying down in the back seat and popped open his door towards me and I thought, do I run now, allow him to confront me or what? The thought of Jesus or Christ went through my mind that instant and miraculously, the youth who was surely going to assault me inexplicably sat back in the car and they drove off as the driver smiled at me and I gave him the peace sign with my hand, don’t ask me why. I was relieved because I thought for sure I would get attacked. Was there some divine intervention or did I just get lucky? Maitreya’s ‘star’ photographed by M.G. in South Brazil on 19 May 2010 at 12.30 am. Maitreya’s ‘star’ photographed in a south-westerly direction, by T.W., on 4 June 2010 over Samnanger, Norway. 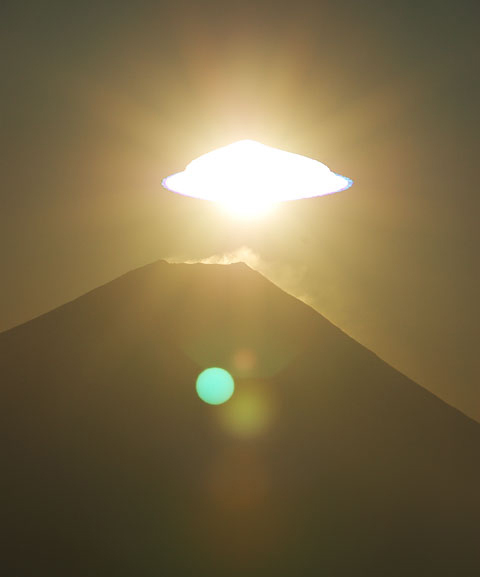 This spacecraft appeared above Mount Fuji, in Japan, as Mr Keita Tachizawa was waiting for the sun to rise on 21 March 2006. It is interesting to note that, according to Benjamin Creme, this is a “medium-sized” mothership, whereas the top of Mount Fuji is over one kilometre in diameter. Note: For more sunrise photographs by Keita Tachizawa see www.feelthefuji.com. 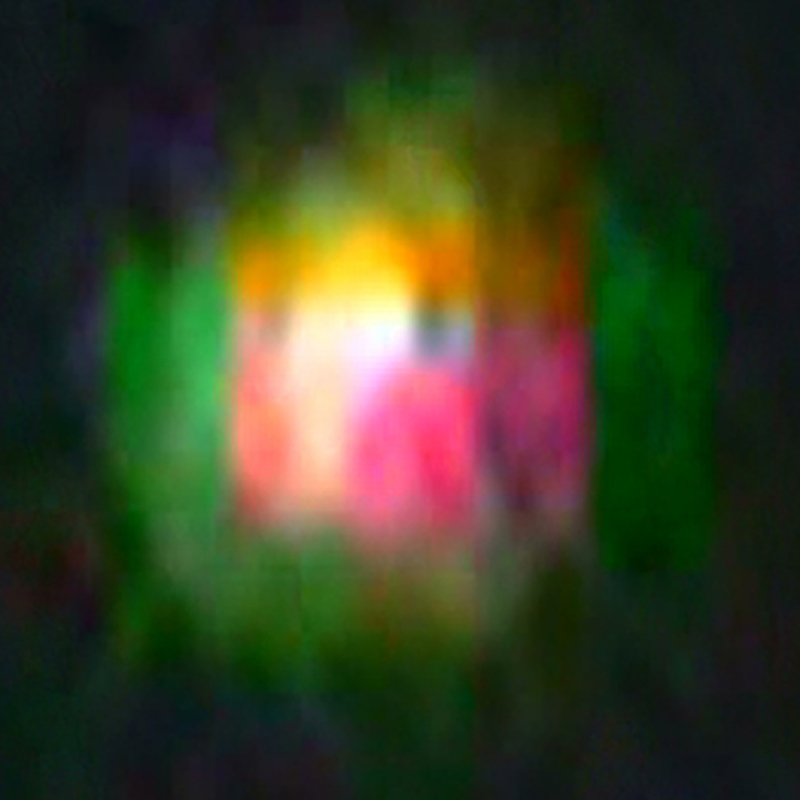 I saw a huge orange light flying close to my home in Cheshire on the 23 April 2010 at approx 10.30pm. I stopped the car and took this photograph. What is it? Allentown Airport, Pennsylvania, USA – On 26 May 2010 a witness saw a low flying greyish craft near Allentown Airport of about 400 to 500 feet long and 150 feet wide, with planes flying above it. According to the witness the craft was silent, and flew so low he thought he could have hit it with a rock. As a result he is positive it was not a military craft. [Maitreya] will show humanity the steps which it should take to regenerate itself, and to create a civilization based on sharing, co-operation and goodwill, leading inevitably to world brotherhood. Soon we shall see this man of extraordinary qualities. Recognize Him by His spiritual potency; His wisdom and breadth of view; His inclusiveness and love; His grasp of human problems and ability to indicate the solutions to man’s dilemma – political and economic; religious and social. Now, as we enter the time of renewal, men should understand the principles on which a correct advance can be made. Brotherhood, itself a fact in nature, must more and more determine the nature of the new forms. All that is awakened to the fact of brotherhood will find itself in the centre of the path to the future. All that pertains to brotherhood will find the quickening energy of Hierarchy flowing to its cause. Peace will be established on the idea of brotherhood, ridding the world for ever of the canker of war. If [Maitreya] could teach men how to love then He would have established man’s brotherhood, because what prevents the establishment of the brotherhood and sisterhood of men and women is that there is little or no expression of love. Love is difficult, we all know; it is difficult to love. Some people find it easy, but even those who find it easy to love, whose nature it is to love, given a little resistance to that love turn obdurate. The love stops flowing. It is easy to love when there is no resistance to it. But when you love somebody who does something that you do not like, it is difficult to go on loving. In other words, we have reactive love, even if it is a kind of love. 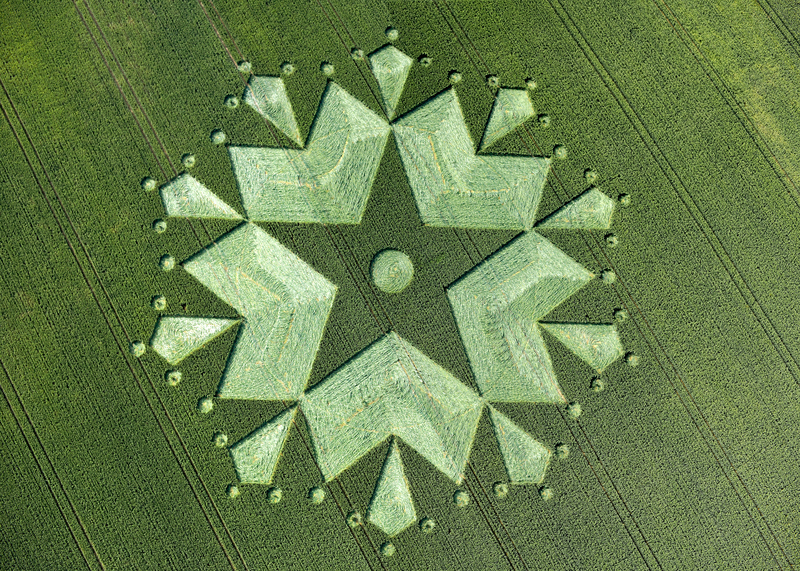 As we near the beginning of a new era, the thoughts of men turn to the sky and the possibilities which exist for future travel between the planets…. At precisely such a time has entered the new Teacher. His will be the task to enlarge even further these horizons for man, to show that all is interconnected, that we live within a family, as brothers, and that each contributes to the well-being of the whole. Thus man will come to sense himself as an integral unit in a vast system which stretches to the stars; as a tiny point of conscious, loving life, without which the Universe would be poorer. Thus man will come to see his greatness, and his function in an endless scheme of interrelated points of light and energy and knowledge. George Adamski: A Herald for the Space Brothers will be of interest to readers of Share International in the way it takes Benjamin Creme’s writings, and particularly his latest book, The Gathering of the Forces of Light, as a context and backdrop for an exploration of what Gerard Aartsen calls the ‘substance’ of George Adamski’s work. Rather than focusing solely on the ‘truth’ of Adamski’s claims about his extra-terrestrial contacts as most writers have done, Aartsen emphazises those aspects of his writings that clearly relate to the Ageless Wisdom teachings. Here Aartsen draws on work by Adamski that is much less well known than his books Flying Saucers Have Landed (1953, co-authored with Desmond Leslie) and Inside the Space Ships (1955). Most of these writings are scattered among a wide range of publications and are largely now out of print. Gerard Aartsen does an invaluable service in bringing them to our attention in this scholarly book. One article by Adamski, ‘The Space People’ (1964), a fascinating account of the nature and lives of Venusians, is published for the first time along with a chapter from Cosmic Philosophy, published in 1961. The book also includes a comprehensive listing of Adamski’s extensive life’s writing. Aartsen’s account of the scientific and political social context for Adamski’s work in the 1950s shows how the ideological struggle between Russia and America for world dominance made any thought of extra-terrestrial life deeply uncomfortable for political leaders, while the materialistic science with its non-acceptance of etheric matter ruled out the possibility of life on other planets that Adamski claimed to have experienced. As Creme points out, this is still true today. Adamski is likened to other ‘pioneers of humanity’, such as Galileo and Blavatsky, who introduced new ways of perceiving the realities of our universe – and who were ignored or excoriated for their pains. The books Flying Saucers have Landed and Inside the Space Ships were the most successful of Adamski’s attempts to show the reality of the space people, and they were both best sellers. Likewise he gave lectures worldwide to huge audiences. Aartsen shows how Adamski’s experiences, however, were subsequently consistently debunked and he himself was denigrated to such an extent that by the 1960s much less credence was given to him and his work. Yet he emerges as a true worker for humanity, undaunted by the many difficulties he faced. He continued to work, and his writings became increasingly more akin to esoteric teaching, the result usually of his encounters with the space brothers. Adamski’s rather mysterious background included a sojourn in Tibet as a young man that apparently gave him unusual powers. After the death of his Polish father he was taken under the wing of an ‘Uncle Sid’ who, Benjamin Creme’s Master confirms, was actually a Space Brother. Aartsen documents events that testify to the fact that Adamski was himself a Venusian, who had come to Earth on a mission to give information about the space brothers and their work on behalf of our planet; and he shows how this is ‘documented’ in the novel by Desmond Leslie, The Amazing Mr Lutterworth (1958). Benjamin Creme dedicates The Gathering of the Forces of Light: UFOs and their Spiritual Mission to George Adamski as ‘a very brave man and colleague’. Gerard Aartsen in his turn dedicates George Adamski: A Herald for the Space Brothers to Benjamin Creme as ‘himself a herald’. Both books from their different perspectives show the integral relationship of our Space Brothers and our Planetary Spiritual Hierarchy, who work together to save our planet and advance humanity on its evolutionary journey. About the author: Gerard Aartsen, MEd, a Share International co-worker, is a researcher and teacher based in Amsterdam, the Netherlands. For more information see his website www.biblioteca-ga.info. 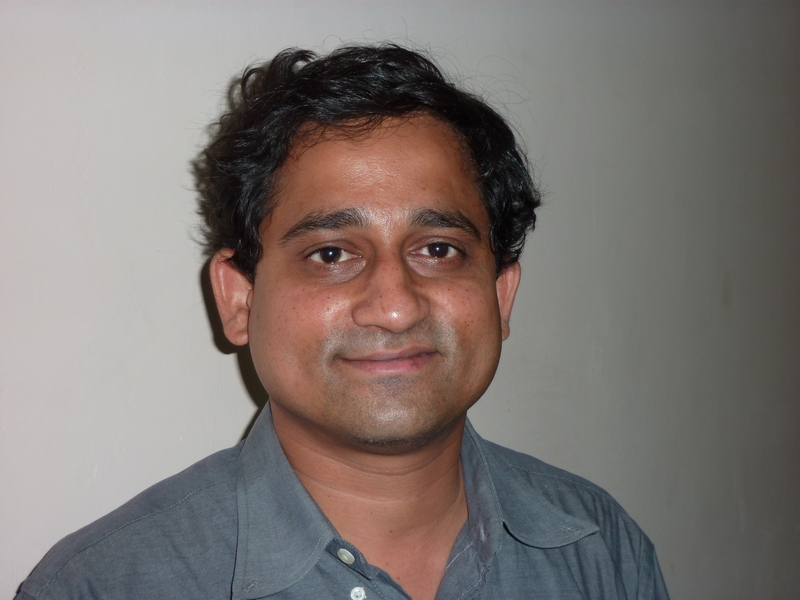 Biraj Patnaik is a Special Advisor to the Supreme Court of India. He was appointed in 2003 with other colleagues to monitor the implementation of all the food and employment schemes of the Indian government. In particular, his office reports to the Supreme Courts on violations by state and central governments relating to the Right to Food programme. Luc Guillory interviewed him in Delhi in June 2010 for Share International. Share International: Could you explain what the Right to Food Case is, how it started and who initiated it? Biraj Patnaik: It is the longest legal case in any court in India, and the world, on a very fundamental idea, namely, that every citizen of every country should get access to food, and that no one should go hungry. The Case was initiated because India, like most countries in the world, is a food surplus country and a net exporter of food. In the last 30 years we have achieved self-sufficiency in food and yet we have one of the highest numbers of hungry people in the world. Essentially, the Right to Food Case made an argument in the Supreme Court of India that the right to food should be made a fundamental right. The Case was filed in 2001 by a human rights group called the People Union for Civil Liberties (PUCL) in Rajasthan. But the Supreme Court decided that this problem was not unique to Rajasthan but widespread throughout the country. They therefore took action to extend the Case to the rest of India and asked the government to reply to the demands raised by the petitioners. Because the reply by the government was inadequate the Supreme Court issued orders to enforce the right to food. To date 17 such orders have been issued. SI: I suppose PUCL is not the only group involved in the petition. How many groups are part of the coalition? BP: There are more than 2,000 organizations involved throughout India: people’s movements, NGOs, trade unions, political parties, women’s groups, and so on. It is a very inclusive movement. The Right to Food Campaign has grown to become one of the largest in the history of this country. This pressure of public opinion has led to the National Rural Employment Guarantee Act which was passed by the Parliament in 2005. It guarantees employment to rural households in the countryside at minimum wages. It is the only one of the kind in the world today. It is unique because it is a fusion of social policy with economic policy. It goes against the grain of the neo-liberal thinking that dominates our country, and yet it was passed by a government which is essentially neo-liberal, because of pressure by the people. SI: How does the Rural Employment Guarantee Act work; what has been its success in reality? BP: At first, it was only applicable to 150 districts. But given its popularity, the government quickly had to extend it to the entire country. One has to understand that India has about 1.2 billion people; labour is always readily available. Therefore wages are always depressed and never reflect the minimum wages that government theoretically guarantees. It is always easy to find people who are poorer and ready to work for less. The Guarantee Act has reversed the dynamic between the landowners and the small farmers and agricultural workers, who can now work on their own under government programmes such as building infrastructures, roads. They are no longer compelled to work for landowners for minimum wages. The government has to offer a job within 15 days after receiving the demand. The Act also allows for the construction of rural and agricultural infrastructure on the land owned by poor farmers. Of course, implementing this Act fully will still take time and effort. There are problems such as late payment of wages or difficulties in providing immediate work on request, but experience shows that these difficulties are more easily overcome in parts of the country where civil society is more organized, or where workers have managed to organize themselves in trade unions to demand their rights. 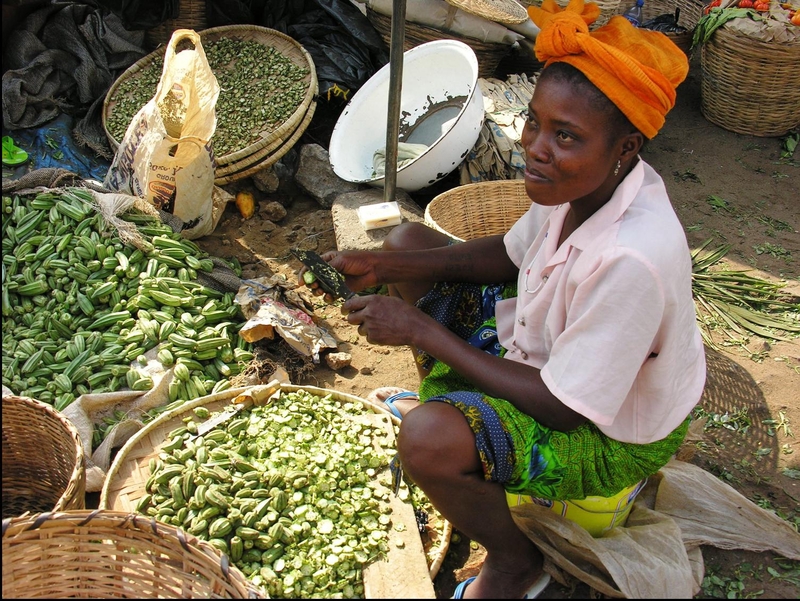 Every citizen of every country should get access to food, and no one should go hungry. SI: I read that among the 17 orders, some are more specifically dedicated to children? BP: The first order of the Supreme Court concerned children because they are the most vulnerable section of our population. And about two-thirds of the total schemes and programmes affect children. One of them is the mid-day meal programme where more than 125 million children get school meals on a daily basis. The Supreme Court has made it a universal right throughout India. Likewise, the Supreme Court was deeply concerned about the fact that India has one of the highest child malnutrition rates in the world. Forty-six per cent of children under the age of six suffer from malnutrition – nearly double the rate of sub-Saharan Africa. So the feeding programme has been extended to some 160 million of those little children. It also includes regular health checks, free school education, services to pregnant mothers. Integrated Child Development Services (ICDS) is the only institutional mechanism, rigorously followed by the Supreme Court, that addresses the needs of children under six years of age through an initial network of some 4,500 ICDS centres nine years ago, but the government has now created 1.4 million of these centres. SI: Have all the states reacted positively? Is the programme equally implemented in all the states? BP: The implementation of the programmes is a function prevalent in any state. In states such as Kerala, Tamil Nadu, Andhra Pradesh, Karnataka or Gujarat, better government has meant a more effective response: they have delivered much more than was ordered by the Supreme Court. Throughout the country results are mixed; the important thing is that states are being forced to implement those programmes because it is a Supreme Court order. SI: Why did the Supreme Court take up this project? BP: India has a tradition of public interest litigation, with the Court regularly playing a very positive role in the economic and social domain. Also, the 20 years of neo-liberal economic growth has created such visible inequity that the Court felt it had to intervene. SI: What was the initial reaction from the politician and state governments? What resistance did the movement meet? BP: The initial reaction from the political world was very, very negative. They thought that the Supreme Court was ‘overstepping’ its remit; that we had got the Judiciary to interfere with something which should have been dealt with by the Executive. But as public support grew for the idea of the right to food, and as the Orders from the Supreme Court continued to be issued, the whole movement gained legitimacy. So much so that today the government is itself proposing legislation called the National Food Security Act which would ensure that no citizen in the country would go hungry. This was simply unthinkable 10 years ago. I remember going to meetings with government bureaucrats who would snigger on hearing the idea of the right to food because they thought it was nonsense. Now we see the drastic change of attitude in the government, largely due to pressure asserted by the people. The movement was a catalyst to make people act and claim their rights. The campaign has channelled and catalysed people’s anger and outrage on the issue of hunger into a meaningful protest so that governments, state and central, are forced to act. SI: People power, that is what I hear in your words. How did the movement make it known to the public to get its support? I saw on the website references to ways of manifesting such as ‘Dharnas’ and ‘Padyatras’; could you explain? BP: There are three or four principal ways in which information about this movement is spreading amongst people. The first is a typical Indian institution which we call Social Audit, a process by which information about schemes and programmes is shared with thousands of people who are benefiting from the programmes on a public platform in the presence of government officials who cannot deny the records. And once other people see the results of this transparency and accountability they bring their support to it. The second way is through periodic rallies at village, state or national levels. For example, over the last six months thousands and thousands of people have gathered in all state capitals to protest against the rising prices of food caused by drought and the lack of implementation of the Supreme Court orders. There is therefore a tremendous grass roots support. ‘Padyatras’ means walking from village to village with a large number of people who spread the message about the schemes and programmes and about the general message of the campaign. Whenever funds are blocked or any other local problems occur, people come together and organize a sit-down, a ‘Dharna’ and also hunger strikes, usually in front of the government offices. The campaign is decentralized and has mobilized many local organizations. At the national level, the campaign has been extremely successful in mobilising Indian media, especially over the last two years. Every major newspaper is carrying on the campaign on behalf of the Right to Food Campaign, by covering stories of hunger and the demands of people for their rights. I remember that when the National Employment Guarantee Act was being proposed, many of the corporate-owned media opposed it vehemently. I was afraid that when the National Food Security Act was being discussed we would meet the same opposition. But I was very surprised to see the overwhelming support. Not a single large newspaper took any editorial stand against the Right to Food Security Act. This has created a huge deal of awareness about the campaign. SI: Can you tell us what were the structural roots of hunger in India and how has malnutrition changed since the beginning of the campaign? BP: Until the 1960s, India was a net importer of food, largely depending on the American food aid. When America invaded Vietnam, India refused to support them. America gave India the choice of either supporting their war or stopping to receive food aid. But India condemned America’s war and consequently America’s food aid stopped. Indian political leaders, led by the then Prime Minister Indira Gandhi, started the Green Revolution in agriculture which led India to become a food surplus nation within 10 years. Now India is a net exporter of food except in some years of calamity, severe drought or monsoon failure. Unfortunately, this does not translate into food reaching poor households because they do not have access to it. Access to food is different from availability of food at national level. In 20 years of neo-liberal policies, the government has neglected agriculture. As a result, agricultural production has stagnated in the last 20 years despite annual economic growth of eight to nine per cent. Sixty per cent of Indians are dependent on agriculture and are consequently impoverished. Large-scale famine has been eradicated in India; the last one occurred in Bengal during the British rule in 1943. Chronic malnutrition does not kill large numbers of people at one time so it is not dramatic or visible and yet it deeply affects all villages continuously, generation after generation. And because it is invisible, it has never been able to generate the political will to address it. Only now are people taking it seriously. With the Right to Food Campaign, we will see a reverse trend and the National Food Security Act will address the structural sources of that neglect; we will see the decline of the malnutrition rate. In two years’ time we will have the figures to assess this. SI: The example of India shows that there are no real obstacles to the implementation of the Right to Food as a Universal Right. Do you think that the case of India can be replicated throughout the world? BP: The idea of the Right to Food has found acceptance throughout the world. India, like other countries such as Brazil, has shown that it is an idea whose time has come, and that we cannot persist with a world with such great inequity, where so few people have access to all the resources that we are not willing to share even though other people are dying in front of our eyes. The Indian model per se may or may not be replicable. The specificity is that it was the Judiciary who took the lead but many countries do not have a strong and independent Judiciary. So there may be different paths, but the goal is the same. Many countries are thinking about implementing National Employment Schemes. Unfortunately, there is still a huge resistance from developed countries to the idea of the Right to Food. Agricultural subsidies in Europe and the US are distorting agricultural prices across the world and developing countries are not able to compete. And yet one in eight Americans is dependent today on food stamps. Out of 8 million babies born every year in the US, an astounding 4 million join the nutrition supplement programme, which is a cash subsidy to mothers who are unable to provide nutritious food for their babies. At the same time, the national defence budget is US$790 billion. A small fraction of that money could solve the problem of malnutrition in America if they would adopt the Right to Food approach. With the economic and financial crisis, trillions of dollars were spent by developed countries in rescuing banks which by their irresponsible behaviour brought the entire financial system of the world almost to a point of closure. And after receiving the bail-outs, the banks continue to get billions of dollars of bonuses. What was the response to the food crisis? The world’s response to the simultaneous food crisis was minuscule, with less than half a billion dollars’ commitment to the one-sixth of humanity affected by this food crisis. Even in the developed nations there is huge inequality, as a few people amass more and more wealth, evidently supported by their own governments, whereas the mass of people are now being asked to bear salary cuts and inflationary pressures. That is literally criminal. It cannot go on for long. The Right to Food movement is gaining a lot of solidarity, not only from the developing world but also from the developed nations. SI: Does it mean that the first duty of a government is to feed its people? BP: Absolutely. Universal access to food, universal healthcare, universal education and universal access to social benefits are the minimum standards that any society should aspire to meet first and foremost, before the needs of industry, corporations, and before defence budgets. These are the things that really matter. I think that all governments will now be pushed to a point where they will have to accept them as the very basic needs of their populations.